By Brian Voo in Mobile. Updated on November 26, 2018 . We all love our smartphones and tablets, but sometimes there’s only so much you can do with the single screen view and limited screen size. Wouldn’t it be great to be able to manage all your data on your Android device like you could on the laptop? With AirDroid, you can. AirDroid lets you connect your Android device with a desktop PC or laptop where you can then access files, send/recieve SMS, install/uninstall apps, and manage bulks of data in your Android smartphone or tablet. Oh, and it lets you do this wirelessly. In order to begin using AirDroid, you must ensure your desktop PC or laptop is on the same (wireless) network as your Android device. This is to link up your mobile device with your desktop PC or laptop. 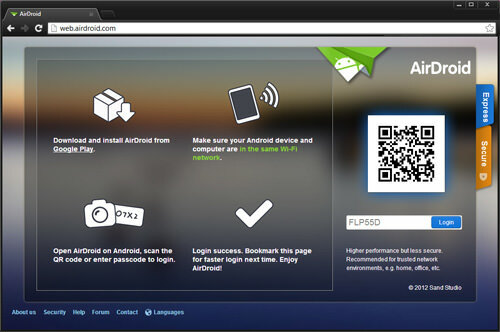 On your Android device, go to Google Play and download and install AirDroid. Run the app. 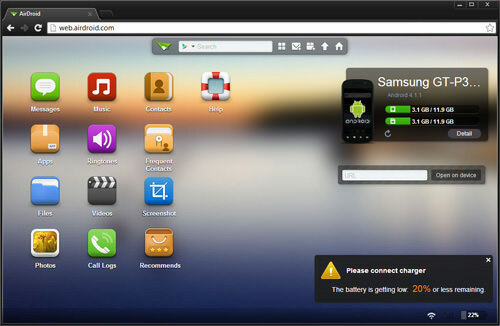 On your desktop PC or laptop, navigate to web.airdroid.com or key in the IP address shown on your Android device. You can login by scanning the QR code or punching in a 6-digit code. To enter via QR Code scan: tap the camera button in the AirDroid app. Scan the QR code shown on your browser. To enter via passcode: input the 6-digit passcode you see on your Android device onto your web browser. Once you have successfully logged in, you’ll see icons, and other relevant information about your device. Your devices are now connected. Let’s get to work. After you have logged in, you can click on any of the icons to start managing and controlling your Android device from your desktop PC. Messages – Create, receive or reply SMS messages. Music – Manage and upload music content to your device. Contacts – Manage and edit contact details. Apps – Manage apps installed on your device or install an app with an APK file from your desktop. Ringtones – Manage and upload phone, notification and alarm ringtones. Frequent Contacts – Shows contacts you frequently communicate with. Files – File explorer similar to exploring files when your device is plugged into your computer. Videos – Manage, view and upload video files. Screenshot – Take screenshots of your Android device (rooted devices only). Call Logs – View or delete details of incoming, outgoing or missed calls. Photos – Manage and upload photos on your Android device. There are more things you can do with widgets found on your browser, widgets like the Clipboard and URL Opener, and the Search Bar. The clipboard allows you to control the clipboard of your device. This is good for transferring a long string of text or digits you may want to transfer from your computer to your device. The URL opener opens the copied link on the default browser of your Android device. And lastly, the Search Bar lets you look for apps on the Play Store or on Quixey. Return to the AirDroid main page. Once you’re done using AirDroid, you can tap the Disconnect button on your device and quit the app.